Image Source: I'm Lovin' Animals via Kristen Fox. 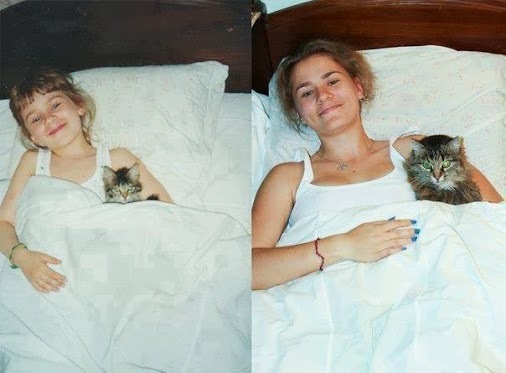 For more interesting photos, pet-themed and otherwise, see Then and Now Photos. When I spoke to you less than three months ago we were all enjoying the warmth and fellowship of a family Christmas. Our thoughts were concentrated on the strong links that bind each generation to the ones that came before and those that will follow. 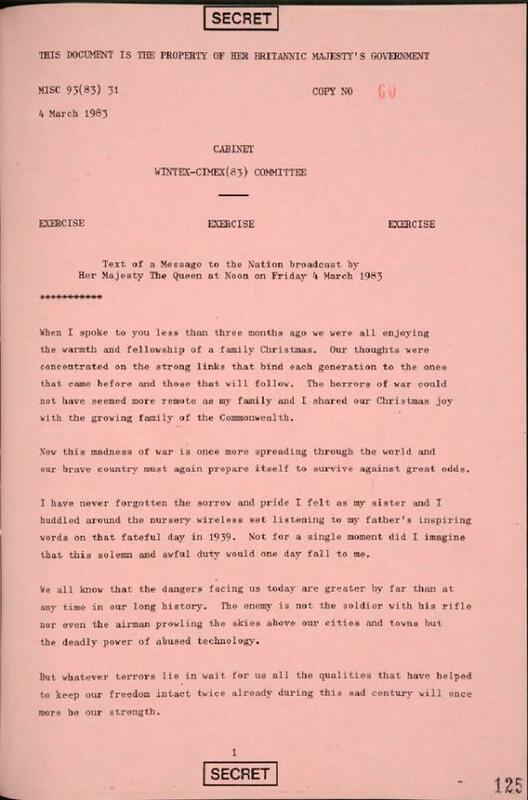 The horrors of war could not have seemed more remote as my family and I shared our Christmas joy with the growing family of the Commonwealth. Now this madness of war is once more spreading through the world and our brave country must again prepare itself to survive against great odds. 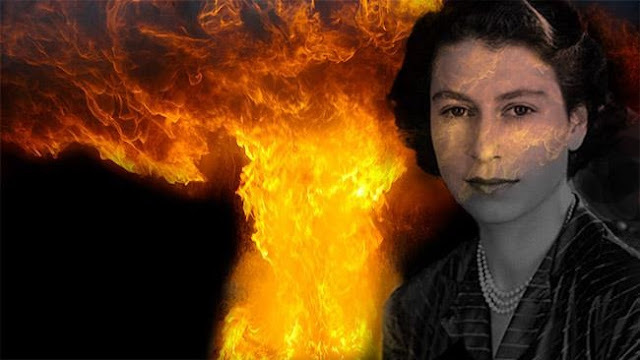 I have never forgotten the sorrow and the pride I felt as my sister and I huddled around the nursery wireless set listening to my father's inspiring words on that fateful day in 1939. Not for a single moment did I imagine that this solemn and awful duty would one day fall to me. My husband and I share with families up and down the land the fear we feel for sons and daughters, husbands and brothers who have left our side to serve their country. My beloved son Andrew is at this moment in action with his unit and we pray continually for his safety and for the safety of all servicemen and women at home and overseas. It is this close bond of family life that must be our greatest defence against the unknown. 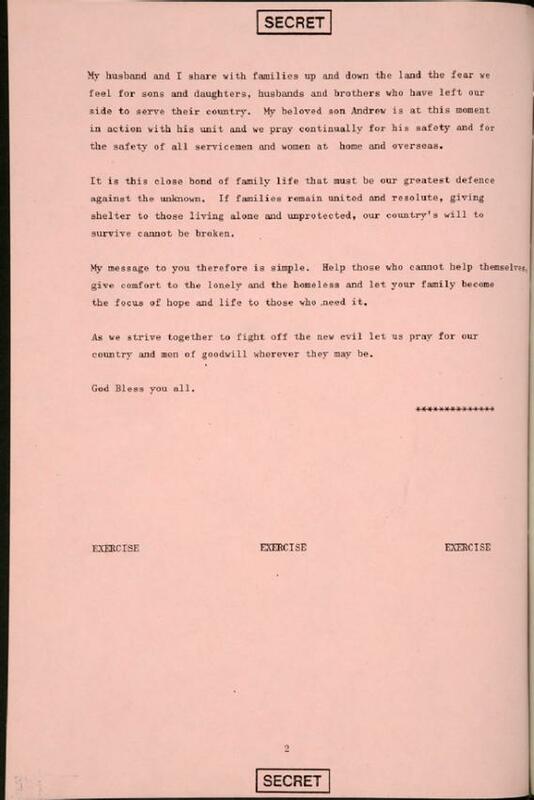 If families remain united and resolute, giving shelter to those living alone and unprotected, our country's will to survive cannot be broken. My message to you therefore is simple. Help those who cannot help themselves, give comfort to the lonely and the homeless and let your family become the focus of hope and life to those who need it. As we strive together to fight off the new evil let us pray for our country and men of goodwill wherever they may be. Bloomberg also ran an excellent piece today on the enormous care and cost it is taking to clean up Hanford in Washington state, USA. Images Source: National Archives of the UK via Conelrad via Slate. 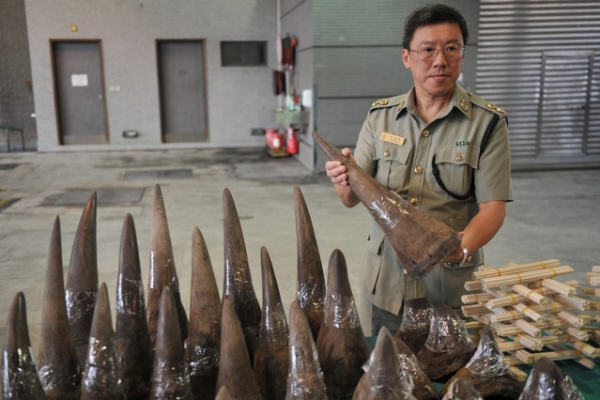 Confiscated rhino horns. Image Source: One More Generation. Ariel Bogle: In recent months, the WWF began trials of unmanned aerial vehicles (UAVs, or drones) where wildlife poaching is occurring. How did this come about? Carter Roberts: In the early 2000s, we thought we had generally solved the wildlife trade. 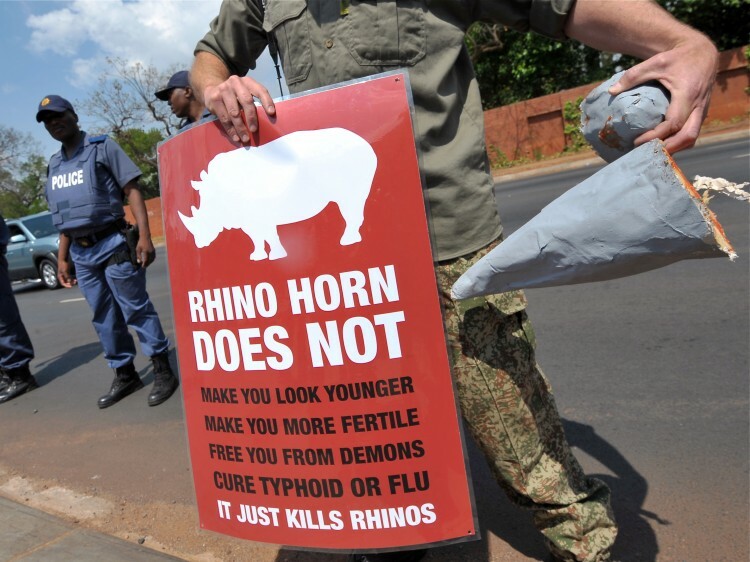 There were only 20 or so rhinos poached a year in South Africa. Then about five years ago, rhino poaching in that country jumped from 20 to 150 animals, to 350, to 450. 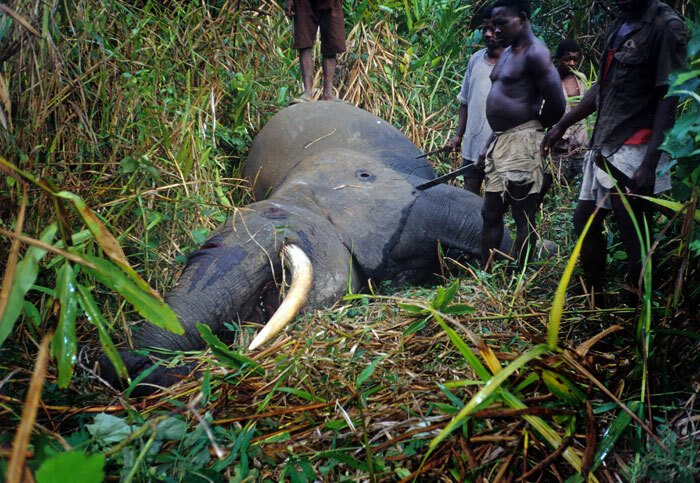 This year, it’s expected to surpass 650, and last year we estimate that we lost 30,000 elephants. Increasingly, we’re learning that this is not your father’s wildlife trade. It used to be for traditional uses, but now it’s the demands of a growing middle class in China, Thailand, Vietnam, and even here in the United States. Very sophisticated crime syndicates are involved, and there’s evidence that these groups are using the proceeds to finance their other activities. They have night-vision goggles, helicopters, and advanced weaponry. We need to acquire better, real-time information. 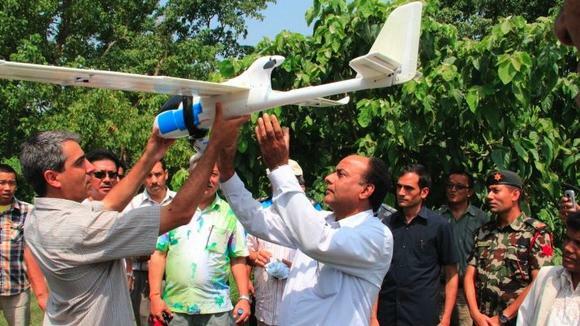 That’s what led us to experiment with using UAVS to track poachers. Poachers often operate at night, and UAVs do a great job at tracking because of their infrared capabilities. A guy in the middle of a big park stands out like a sore thumb when you’re using infrared imagery. The ability to get that information and connect it to people on the ground means you can begin to track the poachers. Bogle: Where have you tested UAVS? Carter: We’ve undertaken trials in Namibia and Nepal. We’re trying to find the sweet spot. UAVs are not going to work in the field if you require a Ph.D. and a military background to operate them. You need simple technology that can be repeated and repaired by people on the ground. We wanted to experiment in places where we controlled more of the variables and then begin trials in areas where the conflict is hotter, where we’re losing the most animals. But we need to make sure we have the infrastructure ready. Bogle: Is there concern about using this technology where the political situation may not be stable? Is there sufficient oversight? Bogle: What other technologies are the WWF considering? Carter: As part of our partnership with Google [the WWF is a recipient of its Global Impact Awards], we want look into how to use tagging and cellphone technology to track animals, employ UAVs to track poachers, and also find software that can put the data together in real time. A “brain” that would allow us to collate information on animals and poachers, so that we can deploy people quickly in the field. The collar we currently put on a rhino costs about $10,000. Imagine being able to use animal tracking chips and UAVs to download that information regularly, and cheaply, without satellites. Being able to gather this information systematically and on a local basis is just common sense. "A few endangered species owe Google a thank you note. The search engine just gave $5 million (UK£3.1 million, AUD$4.77 million) to the World Wildlife Fund (WWF) for unmanned aircraft and other tech to help protect tigers, elephants and rhinos from poachers." The money will go toward high tech and drones like the one above, so that the WWF can locate animals before they are killed and protect them from poachers in Asia and Africa. Image Source: Tech Radar. Image Source: The Epoch Times. Elephant poaching. Image Source: Karl Ammann via the Center for Conservation Biology, University of Washington. 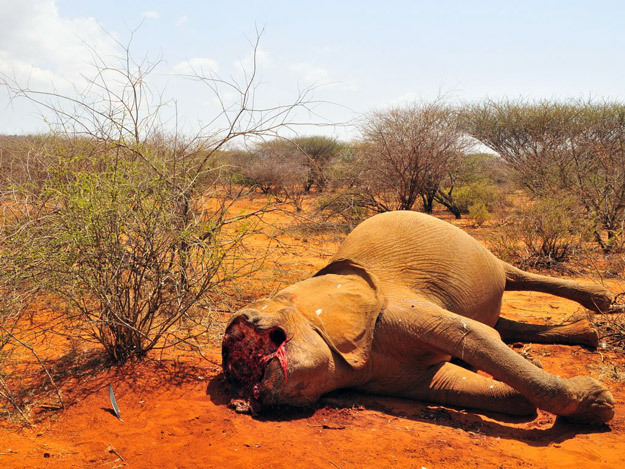 "The carcass of Khadija, a mature female elephant killed by poachers near Kenya's Samburu National Reserve." Image Source: Save the Elephants via National Geographic. "While the press concentrates on the furore surrounding Edward Snowden's search for political asylum, it has forgotten the importance of his revelations." Image Source: Tatyana Lokshina/AP via Guardian. Twitter is under increasing pressure from governments to release users' private information, with requests rising 40% in the first six months of the year, the firm said on Wednesday, in its twice-yearly transparency report. The US made three-quarters of the 1,157 data requests during the six-month period, the company's report said. Governments usually want the emails or IP addresses tied to a Twitter account. 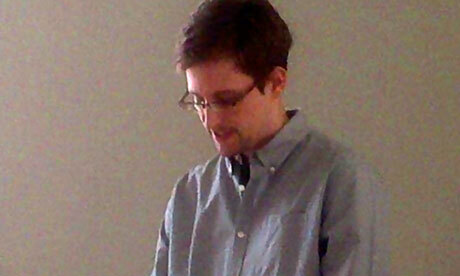 Repeat after me: Edward Snowden is not the story. The story is what he has revealed about the hidden wiring of our networked world. This insight seems to have escaped most of the world's mainstream media, for reasons that escape me but would not have surprised Evelyn Waugh, whose contempt for journalists was one of his few endearing characteristics. The obvious explanations are: incorrigible ignorance; the imperative to personalise stories; or gullibility in swallowing US government spin, which brands Snowden as a spy rather than a whistleblower. In a way, it doesn't matter why the media lost the scent. What matters is that they did. So as a public service, let us summarise what Snowden has achieved thus far. Without him, we would not know how the National Security Agency (NSA) had been able to access the emails, Facebook accounts and videos of citizens across the world; or how it had secretly acquired the phone records of millions of Americans; or how, through a secret court, it has been able to bend nine US internet companies to its demands for access to their users' data. Similarly, without Snowden, we would not be debating whether the US government should have turned surveillance into a huge, privatised business, offering data-mining contracts to private contractors such as Booz Allen Hamilton and, in the process, high-level security clearance to thousands of people who shouldn't have it. Nor would there be – finally – a serious debate between Europe (excluding the UK, which in these matters is just an overseas franchise of the US) and the United States about where the proper balance between freedom and security lies. These are pretty significant outcomes and they're just the first-order consequences of Snowden's activities. As far as most of our mass media are concerned, though, they have gone largely unremarked. Instead, we have been fed a constant stream of journalistic pap – speculation about Snowden's travel plans, asylum requests, state of mind, physical appearance, etc. The "human interest" angle has trumped the real story, which is what the NSA revelations tell us about how our networked world actually works and the direction in which it is heading. As an antidote, here are some of the things we should be thinking about as a result of what we have learned so far. The first is that the days of the internet as a truly global network are numbered. It was always a possibility that the system would eventually be Balkanised, ie divided into a number of geographical or jurisdiction-determined subnets as societies such as China, Russia, Iran and other Islamic states decided that they needed to control how their citizens communicated. Now, Balkanisation is a certainty. Second, the issue of internet governance is about to become very contentious. Given what we now know about how the US and its satraps have been abusing their privileged position in the global infrastructure, the idea that the western powers can be allowed to continue to control it has become untenable. Third, as Evgeny Morozov has pointed out, the Obama administration's "internet freedom agenda" has been exposed as patronising cant. "Today," he writes, "the rhetoric of the 'internet freedom agenda' looks as trustworthy as George Bush's 'freedom agenda' after Abu Ghraib." That's all at nation-state level. But the Snowden revelations also have implications for you and me. They tell us, for example, that no US-based internet company can be trusted to protect our privacy or data. The fact is that Google, Facebook, Yahoo, Amazon, Apple and Microsoft are all integral components of the US cyber-surveillance system. Nothing, but nothing, that is stored in their "cloud" services can be guaranteed to be safe from surveillance or from illicit downloading by employees of the consultancies employed by the NSA. That means that if you're thinking of outsourcing your troublesome IT operations to, say, Google or Microsoft, then think again. While Stacy Keibler's ex may have made light of being called a "sellout," he's putting his money where his mouth is when it comes to spending what he earns. 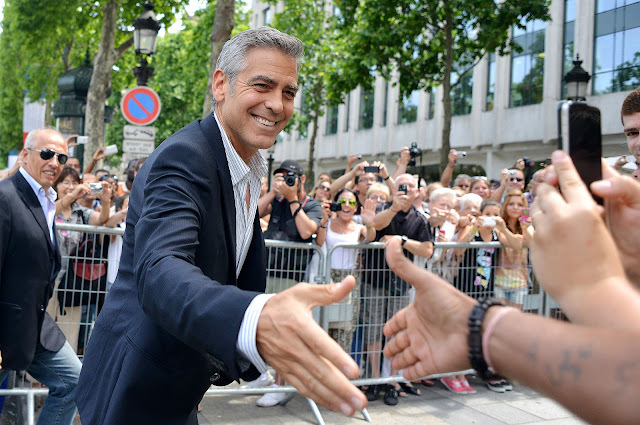 Many stars pocket their ridiculously large paychecks, but George — who appears in commercials for Nespresso — said he's spending the cash on a satellite aimed at Sudan. "Most of the money I make on the [Nespresso] commercials I spend keeping a satellite over the border of North and South Sudan to keep an eye on Omar al-Bashir [the Sudanese dictator charged with war crimes at The Hague]," the Oscar winner said in Paris on Tuesday. "Then [Omar al-Bashir] puts out a statement saying that I'm spying on him and how would I like it if a camera was following me everywhere I went and I go 'Well, welcome to my life Mr. War Criminal.' I want the war criminal to have the same amount of attention that I get. I think that's fair." Here is CNN's executive summary on Al-Bashir. Charged by the International Criminal Court for war crimes in Darfur in 2008, Al-Bashir was reelected as president of Sudan in April 2010. He fled Nigeria's capital on the afternoon of 15 July 2013 to dodge an international arrest warrant for genocide. The war in Darfur, which started in 2003 and is ongoing, has killed between 200,000 and 400,000 people; it arose out of Sudanese conflicts over regional religious differences which overlap with areas of oil wealth and oil's inevitable foreign interests. See further reports: here, here and here. 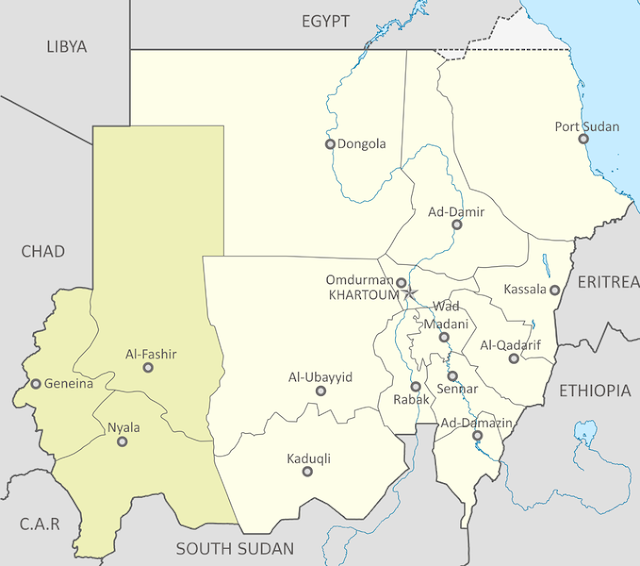 Map of Darfur within Sudan (2011). Image Source: Wiki. The Harvard group focused on a process called telomere shortening. Most cells in the body contain 23 pairs of chromosomes, which carry our DNA. At the ends of each chromosome is a protective cap called a telomere. Each time a cell divides, the telomeres are snipped shorter, until eventually they stop working and the cell dies or goes into a suspended state called "senescence". The process is behind much of the wear and tear associated with ageing. At Harvard, they bred genetically manipulated mice that lacked an enzyme called telomerase that stops telomeres getting shorter. Without the enzyme, the mice aged prematurely and suffered ailments, including a poor sense of smell, smaller brain size, infertility and damaged intestines and spleens. But when DePinho gave the mice injections to reactivate the enzyme, it repaired the damaged tissues and reversed the signs of ageing. "These were severely aged animals, but after a month of treatment they showed a substantial restoration, including the growth of new neurons in their brains," said DePinho. Repeating the trick in humans will be more difficult. Mice make telomerase throughout their lives, but the enzyme is switched off in adult humans, an evolutionary compromise that stops cells growing out of control and turning into cancer. Raising levels of telomerase in people might slow the ageing process, but it makes the risk of cancer soar. DePinho said the treatment might be safe in humans if it were given periodically and only to younger people who do not have tiny clumps of cancer cells already living, unnoticed, in their bodies. David Kipling, who studies ageing at Cardiff University, said: "The goal for human tissue 'rejuvenation' would be to remove senescent cells, or else compensate for the deleterious effects they have on tissues and organs. Although this is a fascinating study, it must be remembered that mice are not little men, particularly with regard to their telomeres, and it remains unclear whether a similar telomerase reactivation in adult humans would lead to the removal of senescent cells." Lynne Cox, a biochemist at Oxford University, said the study was "extremely important" and "provides proof of principle that short-term treatment to restore telomerase in adults already showing age-related tissue degeneration can rejuvenate aged tissues and restore physiological function." 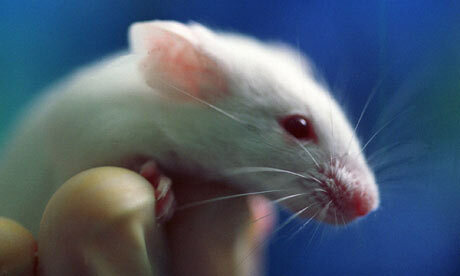 DePinho said none of Harvard's mice developed cancer after the treatment. The team is now investigating whether it extends the lifespan of mice or enables them to live healthier lives into old age. Image Source: Stan Honda / AFP / Getty Images via The National Post. Campgrounds at a California national park have been closed after officials found a plague-infested squirrel. The squirrel was trapped earlier this month and found to be infected with the bacteria that causes plague — also known as the Black Death that is estimated to have wiped out up to 50% of the European population in the 14th and 15th centuries. The plague is caused by the bacterium Yersinia pestis, mostly found in rats and fleas that feed off them. “Plague is a very serious illness, but is treatable with commonly available antibiotics. The earlier a patient seeks medical care and receives treatment that is appropriate for plague, the better their chances are of a full recovery, says the Center for Disease Control and Prevention on its website. “It is important for the public to know that there have only been four cases of human plague in Los Angeles County residents since 1984, none of which were fatal,” said L.A. County health officer Dr. Jonathan Fielding in a statement. The welder's once-strong hands have been withered by the cell-killing infection and darkened to the color of charcoal. Doctors are waiting to see if they can save a portion of his fingers, but the outlook is grim for the man who needs them for his livelihood. "I don't think I can do my job," Gaylord said in a phone interview from a Bend, Ore., hospital. "I'm going to lose all my fingers on both hands. I don't know about my thumbs. The toes – I might lose all them, too." Gaylord, who turns 60 next month, contracted a rare case of the plague trying to take a mouse from the jaws of a choking cat at his home in Prineville, in rural Oregon. He faces a difficult recovery now that he's out of intensive care. His family is trying to raise money to get him into a new house, because the manufactured home he was living in has a leaky roof, a moldy bathroom and mice – dangerous living conditions for a man with a weakened immune system. "We didn't even know the plague was around anymore," said his sister, Diana Gaylord. "We thought that was an ancient, ancient disease." The bacterium that causes the plague is carried by fleas, which can infect people and animals. The disease that killed millions in the Middle Ages is extremely rare in current times – an average of seven cases occur in the U.S. each year. Gaylord's illness began after he saw a stray cat – who he'd named Charlie – with a dead mouse jammed in the back of his throat. The cat appeared to be choking, so Gaylord and a friend attempted to dislodge the mouse. The friend also contracted the disease, but she was treated successfully before it progressed. 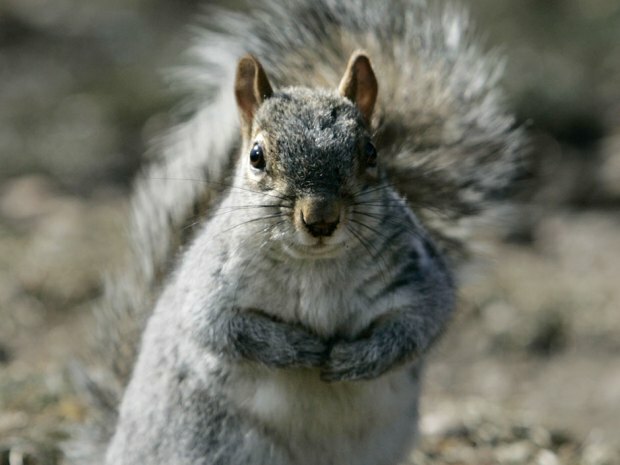 In another 2012 case, a 7-year-old Colorado girl contracted the plague after burying a dead squirrel. Also in 2012, the FDA approved a new 2012 antibiotic, Levaquin, known generically as levofloxacin, and made by Johnson & Johnson, to treat the plague. Image Source: Der Spiegel via SOTT. 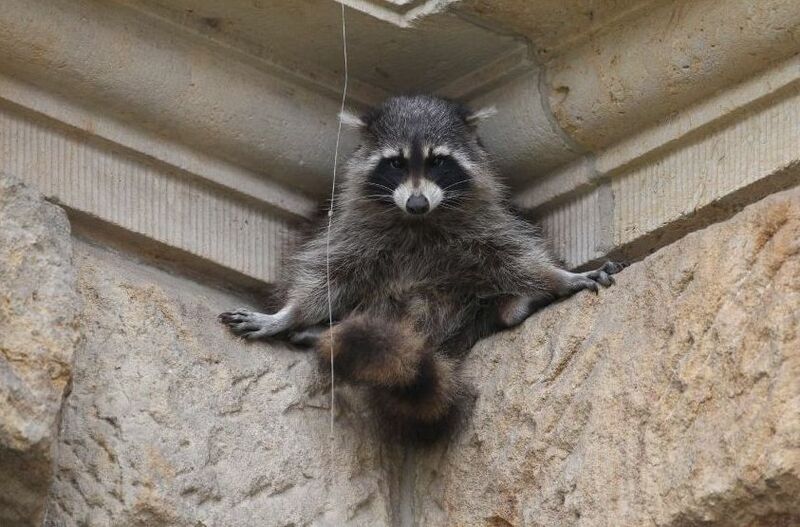 Goering ordered the release of a breeding pair of raccoons when he was the Third Reich’s chief forester in 1934, to give hunters something to shoot. More got out in 1945 when an Allied bomb hit a farm where they were being reared for their pelts. [A]t the request of the Reich Forestry Service, ... [Goering] authorised a pair to be released into the German countryside both to “enrich local fauna” and for sport. In the event, the hunted outlasted both the hunters and Hitler: with no natural predators, there are now 500,000 to a million raccoons in Germany, resulting in a decline in songbird numbers due to their fondness for eggs, and millions of pounds worth of damage to property. The animals have since spread to France, Eastern Europe and Russia. The Nazi reference springs in part from an account of the raccoon's origins in Germany that zoologists and wildlife biologists like Ehlert say is a myth. The story has it that one of Hitler's closest advisors, military leader Hermann Goering, personally ordered the release of imported raccoons into Germany's forests, either to foster biodiversity — in utter contrast to the Nazis' evil ideology of human racial purity — or to increase the number of game animals for Germany's avid hunters. Ehlert said a forestry official did release two pairs of raccoons from the United States into the wild in 1934 to promote diversity of fauna, though Goering had nothing to do with it. Then, during World War II, a bomb destroyed a farm near Berlin where raccoons were being raised for their pelts, allowing about 20 of the critters to escape. These two dozen ancestors essentially gave rise to today's raccoon population in Germany, which is impossible to tally exactly but which Hohmann estimates is edging toward the 1 million mark. The initial German releases were compounded when departing NATO soldiers turned loose their raccoon mascots in France in the 1960s. 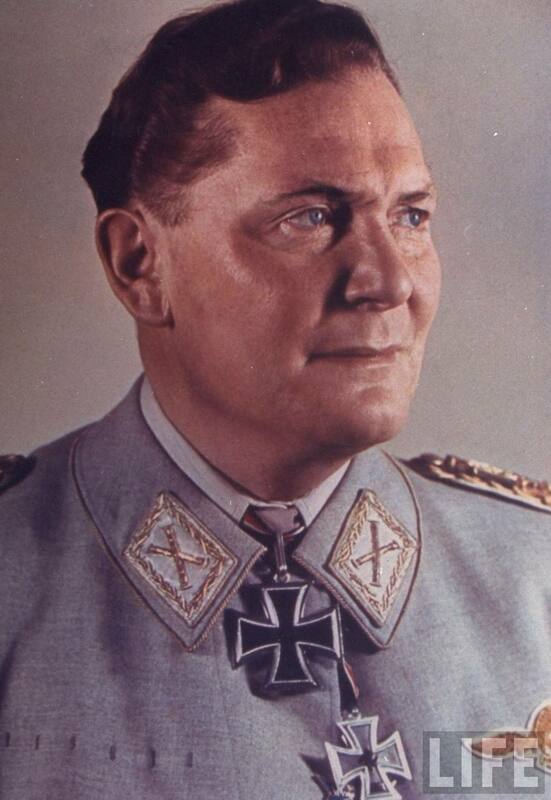 Like many stories in the media these days, the Goering connection is so compelling that it is reported even though it's not true. The false story becomes the generally-accepted truth. If anything, the real Nazi legacy here comes from Joseph Goebbels, Hitler's propaganda minister. And the spread of raccoons, like the spread of the cane toad in Australia, is an ongoing corner of ecological history, the environmental dimension of human affairs. Hermann Goering (1893-1946), WWI flying ace, founder of the Gestapo, and WWII Nazi commander of Hitler's air force. He was the first Nazi authority at the scene when the Reichstag burnt down in 1933. But the raccoons in German back gardens are not part of his legacy. Image Source: Heinrich Hoffman via Life via dA. [A] team of researchers successfully implanted false memories in mice. To implant the memories, the researchers something called used optogenetics — the use of optics and genetics to control individual neurons in the brain. 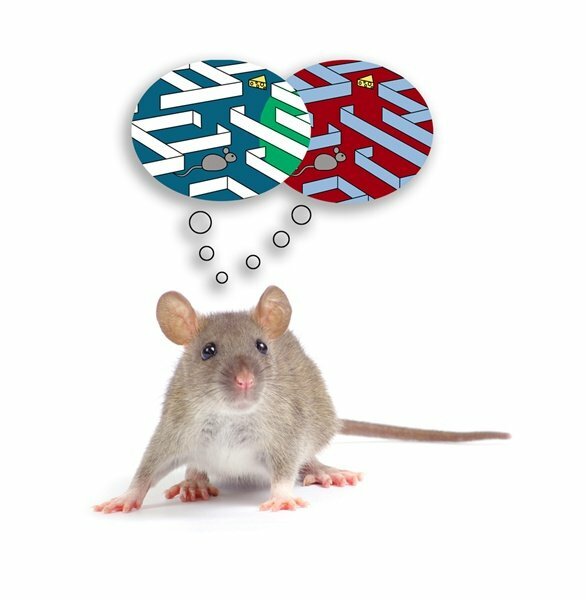 They first genetically engineering mice so that they would have light-sensitive proteins — called Channelrhodopsin-2 or ChR2 — in their hippocampus, which is the part of the brain used in forming memories. Therefore, when the mouse formed memories, the researchers could effectively see which regions of the hippocampus were activated. Also, using light they could activate those areas to have the mouse recall those memories, and they achieved that by having a thin fibre optic cable implanted in the mouse's head. Placing the mouse into a box — called Chamber A — they let it calmly explore for 10 minutes, forming memories about its environment, and they recorded where the memories were formed ... . The next day, they placed the mouse into a different box — Chamber B — with a different environment, and they used light through the fibre optic cable to activate the memories it formed the day before. At that time, while the mouse was remembering Chamber A, they delivered mild shocks through the floor of the box, which caused the mouse to freeze in place ... .
"Here, we were trying to artificially make an association between the light-reactivated memory and the foot shocks. We were just trying to artificially connect the two," said Steve Ramirez, a graduate student at the RIKEN-MIT Center for Neural Circuit Genetics in Cambridge, Massachusetts, who participated in the research, according to Discovery News. Then, putting the mouse back into Chamber A, the mouse froze in fear, apparently remembering that its feet had been shocked in this chamber, even though the shocks took place in the completely different environment of Chamber B (panel 3 of the image above). "They appeared to be recalling being shocked in box A, even though that had never happened," Ramirez said, according to Discovery News. "A false memory had been formed and recalled." Given the fictional applications we've seen for this kind of work, it's easy to see the dark side of this research and its potential use in a dystopian future, but this could have some remarkable therapeutic uses in the present day. Imagine a trauma victim recalling the memories of their trauma, and then having happier memories stimulated to alleviate their stress. For example, a combat veteran suffering from PTSD could be asked to remember a stressful time, while a physician stimulated a part of the hippocampus known to produce more pleasant memories. Ramirez noted that the technique used on humans would probably not involve a fiber optic cable, since that's invasive. But it could involve some kind of drug-induced stimulation, since there are already a number of drugs that target specific brain regions -- recreational drugs, for instance, target reward centers. The trick would be making one that focused on a protein or receptor unique to the hippocampus. The experiment also sheds light on how humans form false memories, said Tonegawa. There are some dramatic examples of people suddenly having a memory of a traumatic event, such as childhood sexual abuse. But sometimes whether the memory is true or not becomes controversial. Tonegawa said his team's most recent work provides an animal model of how false memories can appear. Further work needs to be done to show if false memories look different from the real thing. Readers of more dystopian science fiction might ask if this could be used for mind control. Ramirez said he is conscious of that, even though such an experiment with current technology would never pass muster with an ethics review board. "It's important to be having these conversations now," he said.